The Minsk II agreement has become an apple of discord between the US and the EU, American author and investigative historian Eric Zuesse emphasizes, adding that while the Ukrainian leader backed by the Obama administration continues to violate the accord, German Chancellor Angela Merkel and French President Francois Hollande are insisting that the parties should fulfill the Minsk II provisions. "On Friday, August 29th, this split became public concerning whether the Minsk II accords for ending the Ukrainian civil war should remain in force. Obama supports the view of Ukrainian President, Petro Poroshenko, to violate the Minsk II accords, which would end it; the same day, Hollande and Merkel agreed with Russia's President Vladimir Putin, that the Minsk II agreement needs to be implemented in full," Zuesse underscored. After the recent trilateral meeting between Merkel, Hollande and Poroshenko in Berlin, the three leaders declared their commitment to the Minsk II agreement, saying that it remains the basis for an improvement of the situation in Ukraine. However, neither the Kiev regime nor its patrons in Washington are willing to grant Donbass a special status in accordance with the Minsk II. The "special status" means that Donbass residents will be allowed to elect their own local authorities. Once the conditions of the deal are fulfilled the civil war will be officially over and Donbass will rejoin Ukraine. "Constitutional reform in Ukraine, with a new constitution to come into effect by the end of 2015, the key element of which is decentralization (taking into account peculiarities of particular districts of Donetsk and Lugansk regions, agreed with representatives of these districts), and also approval of permanent legislation on the special status of particular districts of Donetsk and Lugansk region in accordance with the measures spelt out in the attached footnote,[note 1] by the end of 2015," the provision number 11 of the Minsk II accord reads as quoted by Zuesse. Remarkably, on Monday the Ukrainian parliament approved constitutional amendments on the decentralization of power in the country, proposed by Ukrainian President Poroshenko. 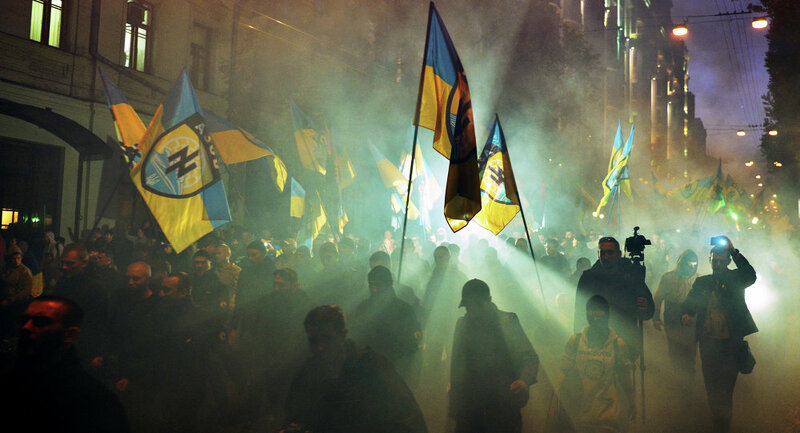 The debates in the parliament prompted violent clashes in Kiev instigated by Ukrainian neo-Nazi groups and parties, in particular, VO Svoboda. However, Poroshenko clarified later that day that the amendment on constitutional reforms in Ukraine does not envisages a "special status" for the Donbass region. Thus far, it is obvious that the Ukrainian president is just paying lip service to his "unwavering" commitment to the Minsk II deal, not raising a finger to mend the situation in eastern Ukraine. Furthermore, there is evidence that Kiev is preparing to resume its military operation in Donbass, the US author hinted. "On August 27th, Edward Basurin, a military official of the Donetsk People's Republic had announced 'UAF Massively shelling DPR — Drastic Deterioration,' saying that, 'The fascists have used heavy artillery prohibited by the Minsk Agreements against the civilian areas of Aleksandrovka and Marinka. The outskirts of Donetsk have been struck'," Zuesse narrated. According to Zuesse, Poroshenko is most likely following the instructions of the Obama administration, most notably the Assistant Secretary of State Victoria Nuland. The US investigative historian called attention to the fact that while US Secretary of State John Kerry put it clear on May 12, 2015 in Sochi that the White House would not support Poroshenko's attempts to take Donbass by force, Victoria Nuland contradicted that openly. "Assistant Secretary Nuland's ongoing visit to Kiev and her discussions with Prime Minister Yatsenyuk and President Poroshenko reaffirm the United States' full and unbreakable support for Ukraine's government, sovereignty, and territorial integrity. We continue to stand shoulder to shoulder with the people of Ukraine and reiterate our deep commitment to a single Ukrainian nation, including Crimea, and all the other regions of Ukraine," the Department's press spokesperson Jeff Rathke emphasized in an official statement on May 15, 2015. Commenting on the issue Zuesse highlighted that "[t]he split between Nuland and Kerry is now a split between the US and Europe; or, as Nuland had said on 4 February 2014 while providing her subordinate in Kiev her instructions about the preparations and outcome of the coup: "F-k the EU!" Perhaps EU officials are getting increasingly cold feet about the entire matter, now a year-and-a-half later."